Mrs. M.––––– ’s Cabinet, a new installation by the Chipstone Foundation, will open in the Constance and Dudley Godfrey American Wing in the Milwaukee Art Museum on February 20, 2016. The Chipstone Foundation is a private foundation based in Milwaukee devoted to the study of American decorative arts and material culture. 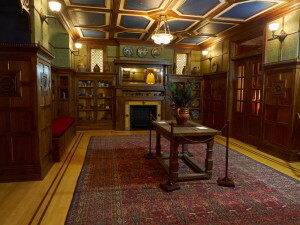 Chipstone has partnered with the Milwaukee Art Museum for more than 15 years to share its collection of early American furniture, ceramics and prints and English ceramics with the community. Mrs. M.––––– ’s Cabinet is a lavish nineteenth-century interior, filled with some of the finest and most diverse objects found in the British Atlantic colonies in the seventeenth century. This Cabinet is designed to inspire wonder, curiosity and perhaps even some mystery. Mrs. M.––––– herself is a mysterious character, one who exists somewhere between fact and fiction. Her remarkable tale and impressive collection allow the Chipstone Foundation to tell unexpectedly true stories about early America. In addition to exploring her priceless collection of historic ceramics, you may pull a golden cord to witness a Pepper’s Ghost illusion, page through Mrs. M.––––– ’s personal scrapbook, or peer into her private office. To learn more, please visit www.chipstone.org or www.MrsMsCabinet.org. Please contact Sarah Anne Carter, scarter@chipstone.org for more information. Images are available at www.MrsMsCabinet.org.